The People’s Choice winner, the Editor’s Choice winner, and other entries in the intarsia category. Nick Berchtold of Perkin, Ill., said this image was just swimming around in his head, so he decided to recreate it in wood. “All of the ideas came out of my head, except for the fish, which I tried to make as close to the real thing as possible,” Nick explained. “Measuring 65″ by 42″, it is the biggest piece I have made so far.” Nick spent four months working on the project. “It was like having a full-time job over my summer break,” Nick said. Nick did not use any stains on the project. He used more than 50 different woods, including everything from pink ivory to pine 2x4s. The piece was finished with polyurethane. 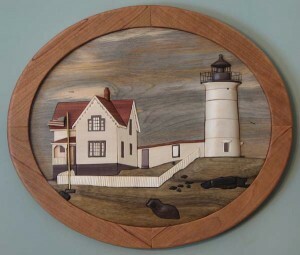 Lighthouse Intarsia by Duane Martin earned Editor’s Choice. A local lighthouse inspired Duane Martin of Newfields, N.H., to create this striking scene. “From the time he started the pattern, it took Duane about three weeks to finish the project. In addition to the spalted pine Duane used for the sky and clouds, Duane used a variety of domestic and exotic hardwoods for this piece, but he did not stain any of the woods. 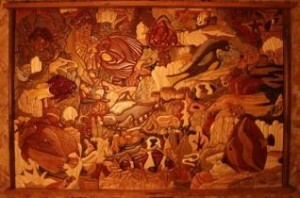 All of the pieces are the natural colors of the various wood.